Incontinence can undoubtedly be one of the more embarrassing symptoms of menopause, especially due to the fact that you never know when you might be affected. If you know you struggle with bladder control, it is helpful to be aware of a few strategies for dealing with constantly leaking urine - especially for when you are out. Below, find information on some of the simplest options. Try to consider what your routine will be and the places that you will visit each day. For example, especially when going to new building or area, it is advisable to identify where the toilets are as soon as you can. Similarly, if you know you won't have access to the bathroom for a period of time, try to take this into account and schedule your intake of fluids accordingly. Although it is important that you consume the recommended amount of 6 - 8 eight glasses of drinks per day, if you suffer from incontinence, you should plan to consume water and other beverages when you can access a bathroom easily. This might seem inevitable considering the nature of the condition, but it should be noted that it is important that you visit the toilet habitually. Some women find it embarrassing to have to use the bathroom so frequently, but be assured that this is the more favorable option. If you try to avoid urinating and hold it in, you are putting more pressure on your bladder, thereby increasing the likeliness of leaking urine. When you are overcome with an urgent sensation of needing to void your bladder, the last thing you need is to be confronted with tricky fastenings or any clothing that takes time to remove. Instead, choose light, uncomplicated dresses and skirts, or trousers and shorts with elasticated waistbands. This should ensure that as soon as you are in the vicinity of a toilet, you can proceed with urination straight away. Gone are the days when the only external support available was a bulky adult diaper. Today, it is possible to find small, discreet incontinence pads that are effective and reliable. Depended on by many women, they can be bought in pharmacies and supermarkets quite easily. Many women make the choice to use sanitary towels instead of incontinence pads, but this is not recommended due to the difference in material and technology. Sanitary towels are not designed to hold a substantial quantity of liquid, and they cannot absorb urine to the same extent. This can lead to excess dampness, which can cause skin irritation and rashes. 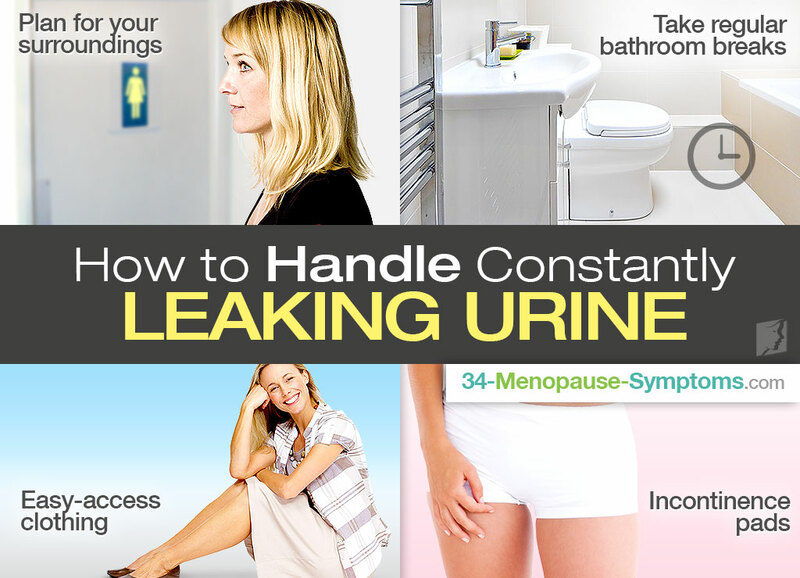 Understanding how to handle constantly leaking urine can be a considerable learning curve, but it is helpful to be aware of some of the many options there are for coping with this common symptom of menopause. Having said this, incontinence doesn't have to be something that is merely put up with. There are things you can do to treat the condition and improve bladder control. For more information, click here.